With an online platform most organizations earn TWICE as much as paper based fundraisers. It’s so easy! Our BlazeRaise system creates a separate fundraising page for each participant. They can email it to friends and family and share it on social media, making it safe and easy for people to make donations. BlazeRaise has everything already set up for you! You just fill in the blanks, add your participants and start raising more money! Our system even sends out reminders to your participants and keeps track of all the funds raised! When the fundraiser is over we send you a check and a detailed donation report for your records. Low Cost and Colorful Perks! There are no costs to get started but we ask for a small deposit ($49.95) once you have created your fundraiser. (It will be credited back when your color powder is ordered.) 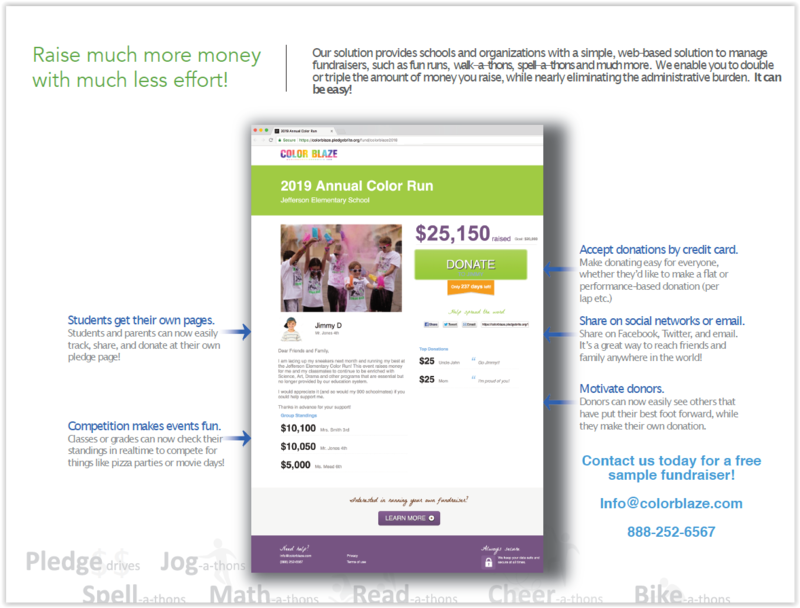 Once the deposit is paid we will send step by step guides, a color fun run checklist, a sample sponsorship letter and facebook and instagram posts that can be used to promote your colorful fun run and heat up your fundraising. In addition you can order color powder at a discounted rate and we will provide all kinds of support to make your fundraiser a huge success. We’ll be your biggest cheerleader and hold your hand along the way. At the end of your fundraiser, we will simply send you a check for the total dollars raised less our 18% fee. How Do You Fundraise with BlazeRaise? A fundraising page is created for each participant that they can email to friends and family or post on social media. The page contains a link that supporters can click on to make a secure donation online using their credit card. How Much Do You Charge to Use BlazeRaise? There are no upfront costs. Once you have created your fundraiser we will ask for a small deposit ($49.95) that will be credited back to you when you order your color powder. We will be sharing some great information and spending a lot of time with you, to make sure you have a successful fundraising campaign, the deposit helps insure we have all the right resources assigned to you. At the end of your fundraiser we will simply send you a check for your total donations less 18%. What Do I Get For the 18% Fee? Dedicated BlazeRaise support person to help you through your entire Fun Run planning process. Can You Track Cash Donations As Well? You bet! 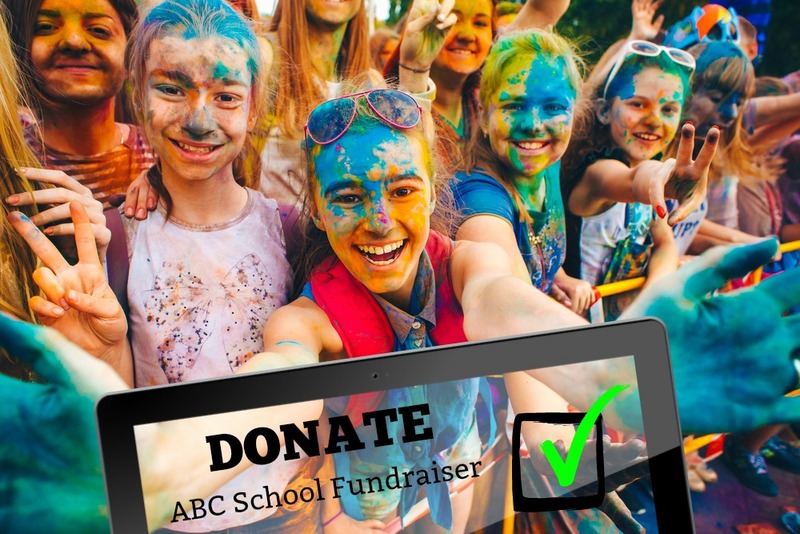 When you receive cash or a check from a supporter our platform allows you to enter that amount into the system so it is easy for you to keep track of all of your donations. You keep 100% of all cash and check donations. Do You Offer Event Registration Also? BlazeRaise is for online donations only and does not support event registration. If you are ready to go you can just click on the “Start Fundraising Now” link on this page. If you’ve got some questions or would like some help setting up your fundraiser just give us a call 888-252-6567 or email us at info@colorblaze.com. We are happy to answer any questions you may have.